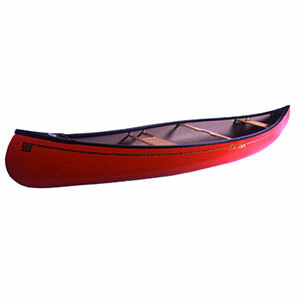 Strong and long lasting canoe for two people to camp or a small family to cruise in. 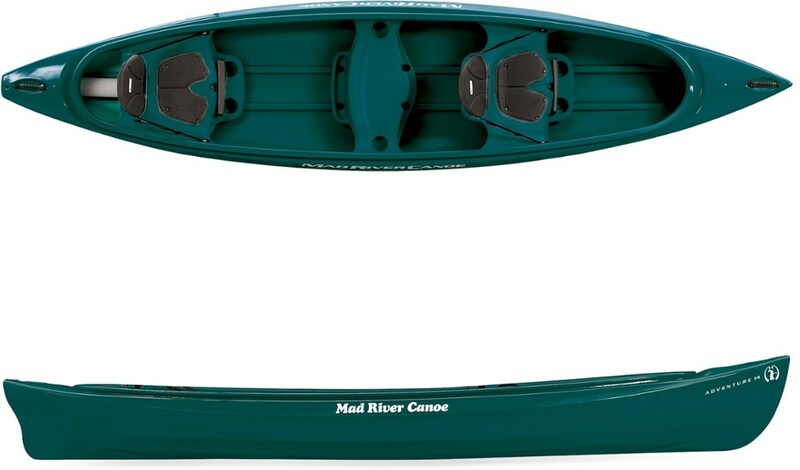 Very durable, but don't count on doing very well on any river that has more than class II rapids. This boat is great. It was a craiglist purchase in great condition. I think someone at Old Town actually told me it is the same boat as the Camper but just a different name from several years ago. I think they just started making two sizes of the Camper instead of keeping the Pathfinder name. Oh it is also less then 15'! See the rest of the specs from the Old town catalog at the bottom. I have ground it over the rivers of North Carolina more times than I can count and have not broken through the initial vinyl red layer even after many serious gouge making grinds and smashings head on or broad side. 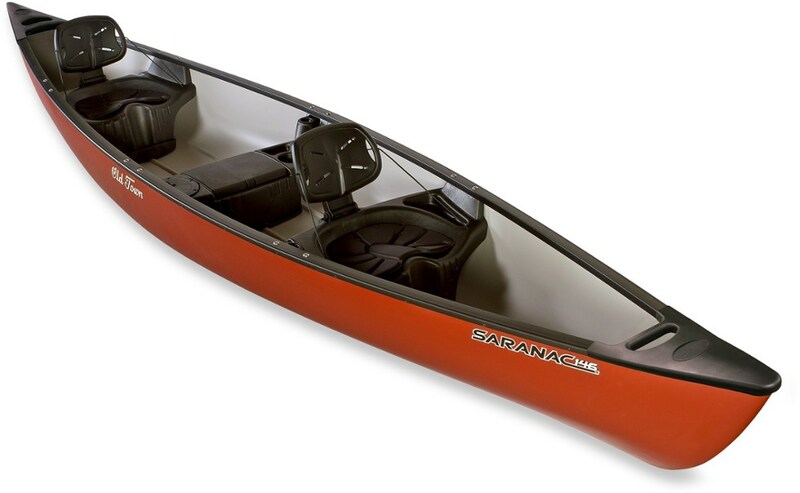 It is also very enjoyable on lakes but will catch the wind as well as any other. All canoes catch the wind though and this will do it only slightly more than something with a straighter bow but probably barely noticeable. This is hands down my favorite boat for the coastal swamps of North Carolina and other cypress knee rivers. The ability to turn with ease is great for tight narrow rivers of both the whitewater variety and swampy cypress oriented ones that carry a quick current with plenty of strainers/branches. It handles all of the Haw even at very high water minus the last little bit of class III which I you might be able to do with some skill but I have shied away. My wife and I took it down the Big South Fork of the Cumberland at very high and fast water while we were fully loaded for several days. We skipped the two major rapids which no canoe except for maybe some sponsored dude in a single Black Fly type canoe could manage with the water being where it was and all those days. We also had to portage a few more. Some of the ones we did run we had to unload our gear and run it empty. The ones we did run fully loaded had some solid standing waves and we were pretty wobbly and loaded with a bit of water coming out the other end of several of them. Some of the class II had upped their game to class III and this boat with two people made it through without tipping but I went out and bought a larger boat right afterword with with more flare and capacity. Class II unloaded all day! Class III not unless you like a challenge and its in a safe enough and warm enough place where you can be ok not making it on occasion even if you are skilled. It is not the best boat for easy tracking especially when soloing (only boat I have soloed other than a Tripper and Gruman). For that purpose it will work fine on a river but tiresome on a lake. Perhaps if it was totally loaded with gear it might do better. With two people it works fine as long as the person in the back has a handle on J strokes and C strokes. I can gingerly stand up in it and cast a fishing rod on a calm day. When I put two grownups in it with one sitting on an added seat that raised them about half way from the floor to the gunwale the boat became a bit tippier. It should be great with two parents and a kid sitting on the floor. Great durable and will last forever. If you are not going down a river and scraping many rocks buy a boat in a lighter material. Awesome 2-person Camper. The Pathfinder has been discontinued. The Old Town Pathfinder is not available from the stores we monitor.